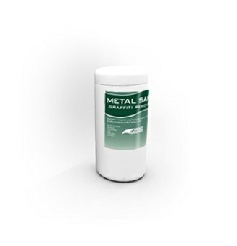 METAL SAFE (WIPES) is a strong, fast acting, convenient, durable and effective impregnated graffiti remover wipe that can be used to remove graffiti on many different non-porous exterior and interior surfaces. It dramatically reduces the time it takes to remove the graffiti with one application effectively removing 99% of the typical graffiti with no damage to the original underlying surface. Packaged in a handy tub this is an easy to use graffiti remover that gets all of the graffiti off the surface within seconds/minutes while other products can take multiple applications (and hours of time) which saves end users significant time and labour. Users can get 2, 3 even 4 times as many graffiti removal jobs accomplished per shift. The product is designed to remove graffiti from pre-finished metal and powder coated products such as garage doors, colour bonded fencing, utility and signal boxes, traffic signs, painted metal surfaces and any other metal surface. It is safe to use as it does not cause damage to these surfaces when applied correctly.